Being a member of the Technology Committee at ER, I am starting to utilize technology in various ways and am trying new things! For example, I am trying a new way to send newsletters to you..through this link. You can click on the subject titles to various links of videos or educational games. If you would still like paper copies of the newsletters, please let me know! 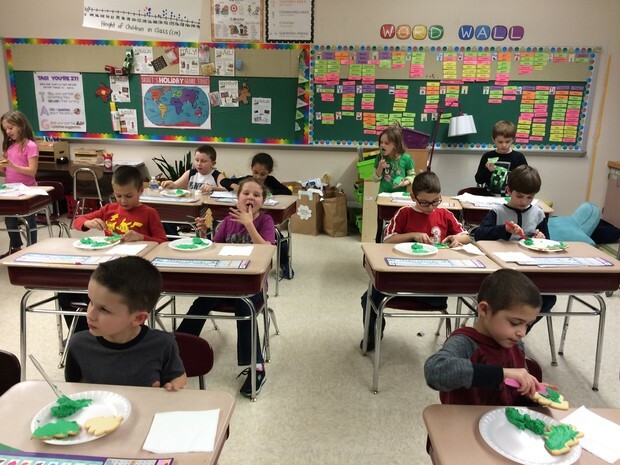 Students have flown all over the world learning about holiday traditions! It has been such a fun unit because each class traveled to other second grade classes to learn about different places. On one day they listened to a story and informational facts and took notes. On the next day, they created a craft to represent the tradition. They have gone to America to learn about Christmas and Kwanzaa, Israel to learn about Hannukah, Italy, Germany and Mexico to learn about Christmas and India to learn about Diwali! Maybe your family can start practicing a tradition they learned about! We quickly completed Unit 3 in Math on measurement and shapes. It was only a 9 lesson unit where students learned to use a ruler to estimate and measure lines, shapes and objects with centimeters and inches. After break, we will start Unit 4. Students will be subtracting two-digit numbers, a very challenging and essential skill. I will send out another newsletter with links and pictures to demonstrate how we solve problems. Measuring | Finding Lengths with a Ruler | ABCya! Measuring is an activity for children to practice finding lengths. Shape Match is a fun educational game for kids to learn and practice 2D and 3D shapes by matching objects to shapes or objects to words. Students learned to take factual notes about different holidays. We also spent time learning about Author's Purpose: Persuade, Inform, Entertain. Students analyzed multiple pictures books and discussed the author's purpose. They found that often times an author has more than one purpose for writing a story! We took what we learned through these mentor texts and wrote persuasive letters. Students wrote letters to Santa persuading him that they have been good this year. After the holiday break, we will be starting our informational writing unit. At the end of this unit, it is my hope that students will be publishing their pieces on the computer. In order to help students efficiency and success in typing, it would be beneficial for your child to practice typing on the computer. The link below has many different typing games in the "Skills" section, such as: Keyboard Invasion, Keyboard Challenge, Retro Typer Keyboarding and Typing Race. Free Educational Second Grade Games and Apps for Kids. We finished Unit 4 on suffixes: ed, es, s, est, er. We will be starting Unit 5 after break. Be on the look out in Weekly Homework Folders. Continued practice with spelling trick words is always beneficial! The Holiday Break is a special time for students to spend with their families. However, it is also a time that can hinder a student's progress because they are not getting the repetition and practice they need. Therefore, over break, students are expected to read every weekday for at least 20 minutes. They will have a reading log to keep track of this. You can encourage your child to keep practicing writing trick words, counting coins, measuring, writing, etc. They can also continue using Math Reflex!